The sibling duo of Carly and Britt McKillip finally see the release of their debut effort after scoring substantial CMT airplay for two singles to date. 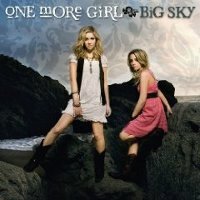 Big Sky nicely fits the mold of today’s modern country musical landscape; guitars dominate the record but the duo’s melodies and musical accompaniment otherwise keep the sister’s in the country realm of the world. With songs like Big Sky, Cry To Me and I Can Love Anyone, there is no reason why this Canadian duo can’t stand shoulder to shoulder with some of their American country music counterparts.